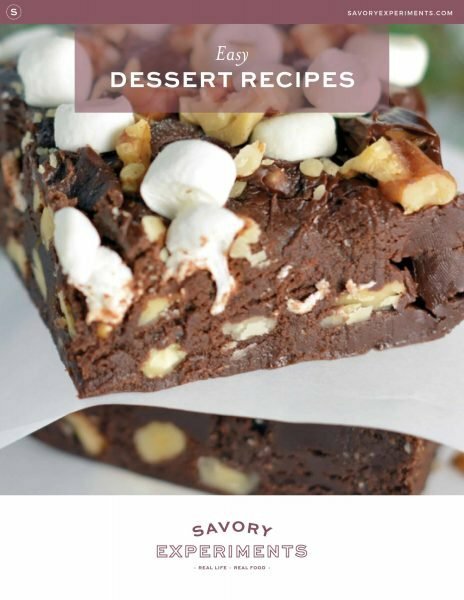 Finish off your grilled summer meals with dessert on the grill too! 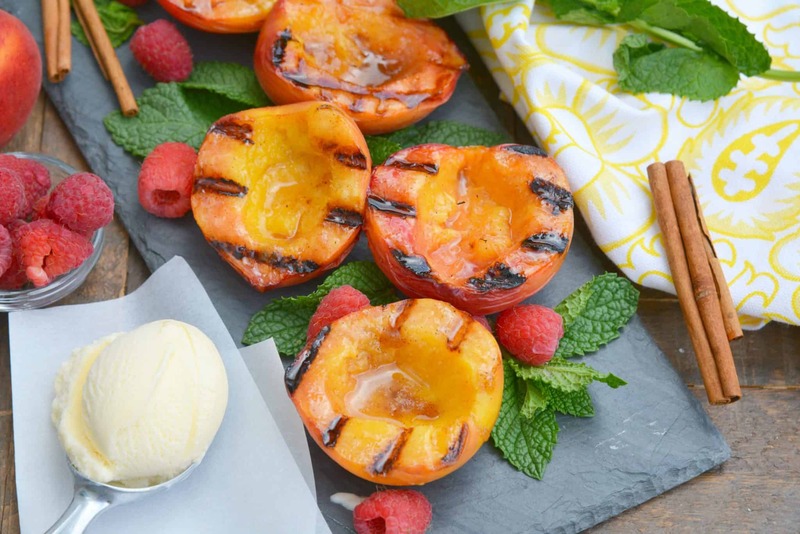 Grilled Peaches are the perfect end to a hot summer day. Basted with butter, brown sugar and cinnamon these peaches will melt in your mouth. 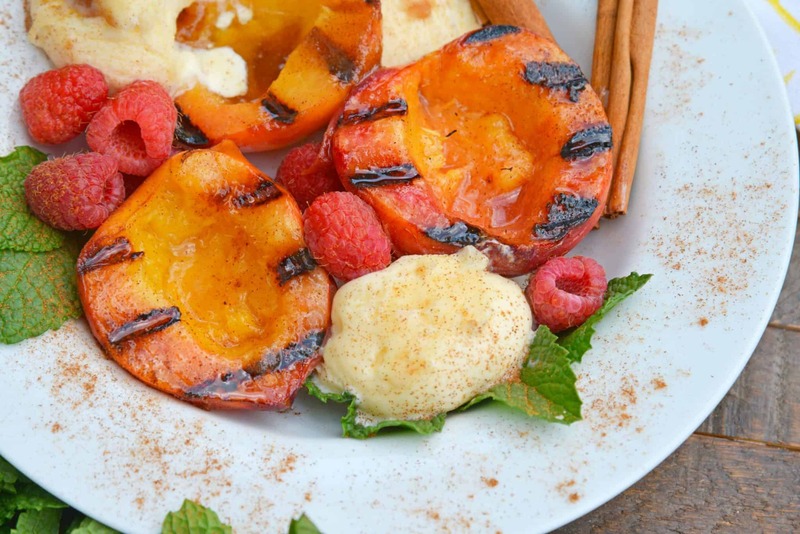 Grilled Peaches basted with cinnamon brown sugar and butter are the ultimate summer dessert idea. Add vanilla ice cream and fresh raspberries for dessert perfection! As I meandered through the produce section, the sweet, intoxicating scent of fresh peaches hit my nose before I even saw the display. My fate was sealed, we would be having peaches in some capacity today. 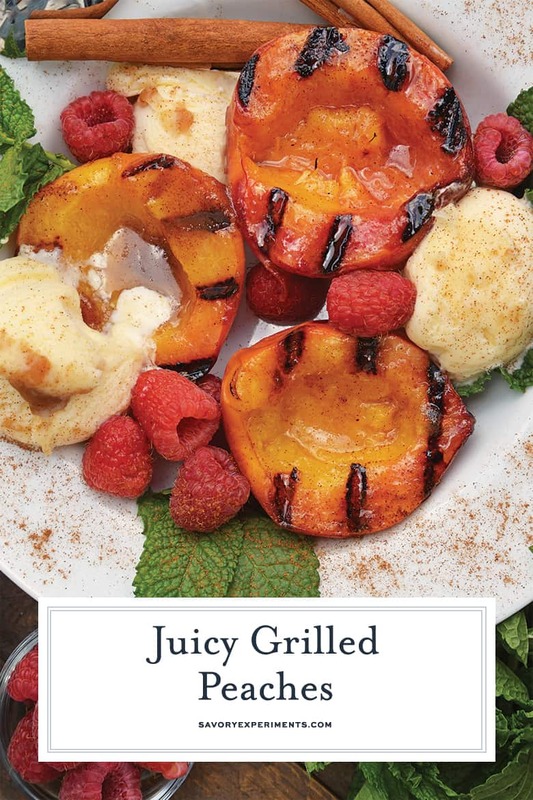 To make stunning grilled peaches, they need a nice initial char, but are then moved to indirect heat. Gotta have those lovely grill marks, right? After the initial sear, you can even shut off the grill, keeping them warm and ready for serving for up to 30 minutes. This means you can make your delicious grilled meal and then throw on the peaches while you eat. They will be soft, caramelized peaches just about the time supper is done. And then you are also getting your fruit for the day. Nevermind that they are basted with butter, brown sugar and cinnamon. Just don’t think about that. Wink, wink. 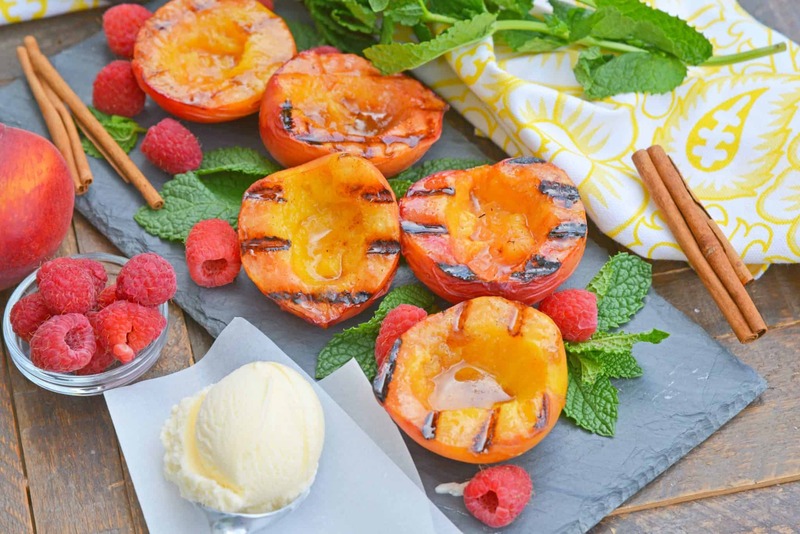 The only thing that makes this Grilled Peaches recipe better is… (drum roll, please) vanilla bean ice cream! Cold, churned cream is the perfect accompaniment for warm, gooey desserts, especially peaches. Fresh mint and bright raspberries make it a flavorful and stunning dessert. 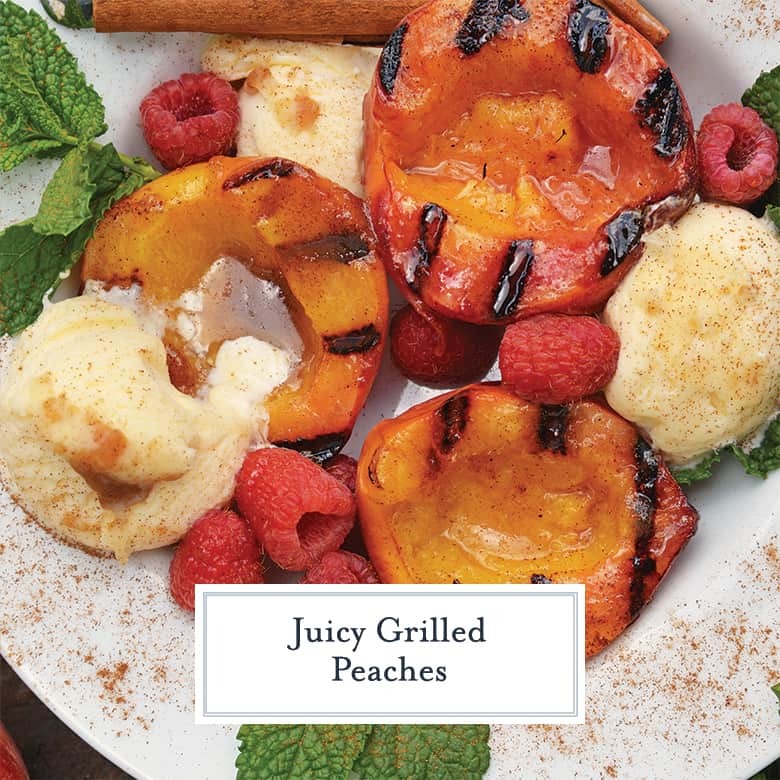 Grilled peaches are perfect for a cozy family dinner at home, but also for a BBQ or party. 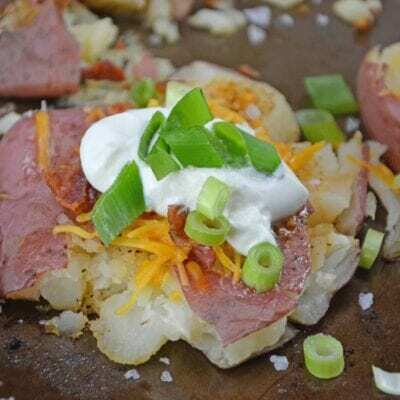 Just load them onto the grill and transfer them to a large serving dish with ice cream on the side, allowing folks to make their own grilled peach creation. 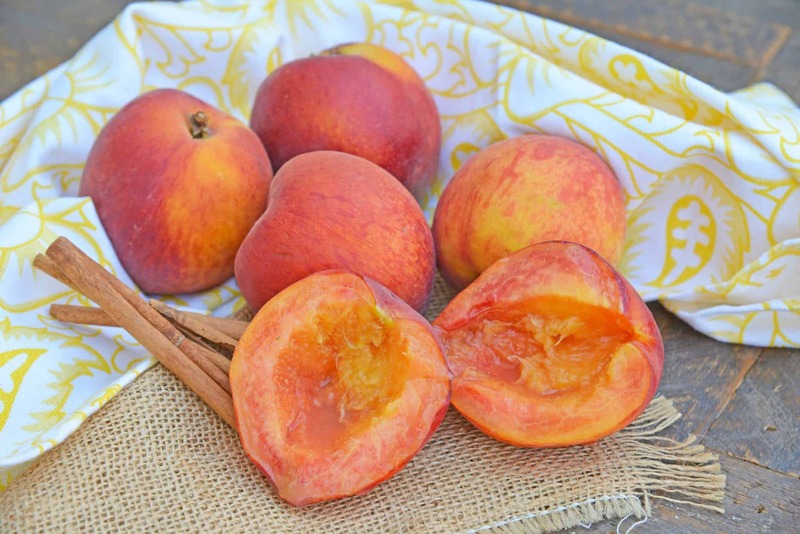 This recipe can be used for any grilled stone fruit. 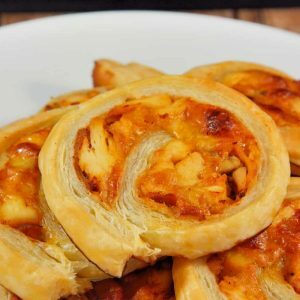 Try it with plums and nectarines, too! Depending on size, they might not need as long to cook. 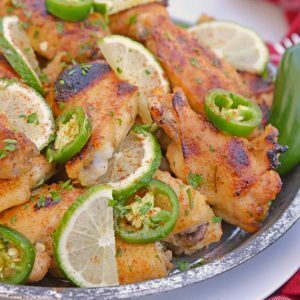 – one with a long handle is best for the grill. It prevents you from burning yourself, but being able to access the whole grill top. 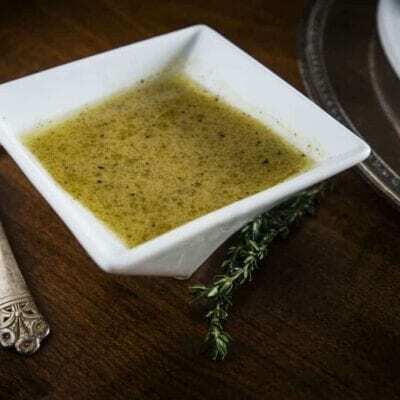 – Especially when you are grilling with sugary sauce, flare-ups are inevitable. Have a spray bottle near to put them out and prevent fires and burning on your food. Prepare the grill by heating to medium heat. Baste cut side of peaches with canola oil. 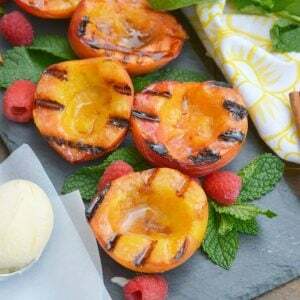 Place peaches, cut side down, on the grill for 2-3 minutes. Baste uncut side and flip, transferring to indirect heat. Baste or spoon butter mixture to cut side of peaches. 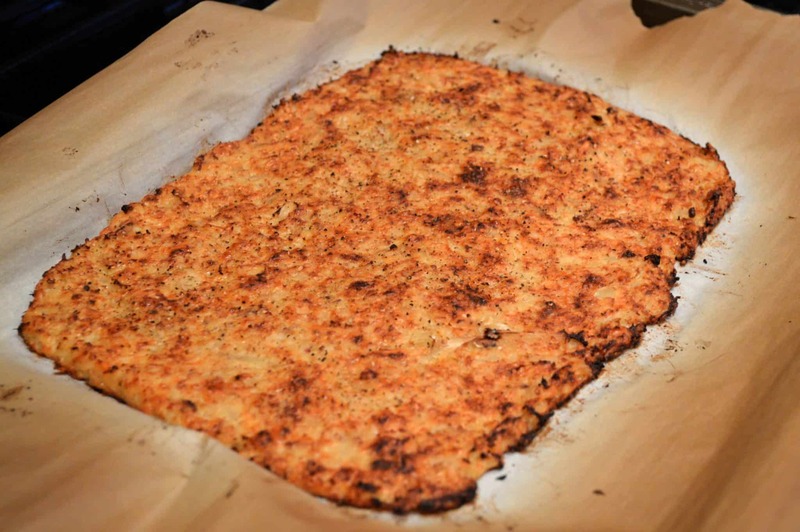 Allow to cook for an additional 5 minutes on indirect heat. 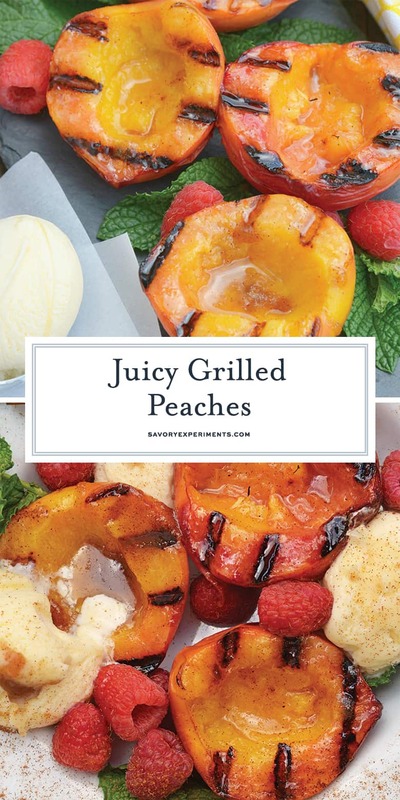 At this point, you can serve immediately or turn off and shut the grill to keep peaches warm for up to 30 minutes, or until you are done eating dinner and ready for dessert. 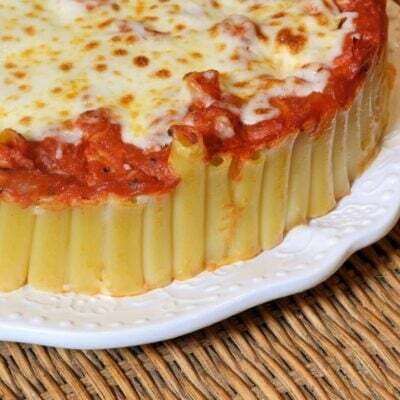 Serve with vanilla ice cream, raspberries and fresh mint leaves.